The adage "the world is a circus" holds very true for the Charles Chipperfield's family, who are the eighth generation of the Chipperfields to be involved in circuses. Mr Chipperfield's circus was established in 1684 and is the largest in the UK. It is giving daily shows at the Splash and Fun Park in Bahar ic-Caghaq. The 30-strong troupe of acrobats, gymnasts, clowns and showmen, who hail from a number of countries, have performed with the leading circuses in the world. Mr Chipperfield, whose ancestors had about 20 elephants and 70 wild animals including giraffes and hippos, in addition to 120-odd horses, said he felt the majority of people in Malta preferred to see a circus without animals. Like him, most of his performers have been born and bred in circuses and none of them can imagine life out of one. At 56, Alexandru Iosif, a Romanian who leads one of the troupes, is no longer jumping and performing the dazzling flying acts that his energetic younger athletes do, but he is there in the ring guiding them and working with the artistes. "In a circus you need the people who are performing the acts, but you also need people like me who have done it and who actively give a hand during the shows," he explains. Seeing gymnasts flying through the air, making somersaults and landing squarely on nets or on canvas, Mr Iosif said there is only one thing going through a performer's mind as he is in mid air: landing on the nets. "I cannot imagine living outside a circus. Seeing people happy gives you an immense satisfaction. Our life is good when people applaud and enjoy themselves," he said. Twenty two-year-old Vitali Eremia, a Moldovan gymnast who represented his country in the 1998 Olympic games, said after diving from springboards, he decided to join a circus. "It's hard work but it's fun travelling around towns and performing in different places. I can't think of anything better to do and I can't see myself out of a circus," he said. Guilherme Cardinali, a 47-year-old clown, has been a performing artiste since he was 14. "All my family were brought up in circuses. I can't be sure who started it in my ancestry, but I have no intention of breaking it either," he said. Among the awards under his belt, Mr Cardinali won the gold award for best clown at the Montecarlo circus championships. Is it tough to be a clown? "Everything is as difficult or as easy as you want to make it. For me, it's easy. I like to make people laugh," he says. How true is it is that at times clowns are desperate inside but still have to make people laugh? "The curtain through which we pass is a magical one. When you pass true it to face the audience, you have to leave the world behind you. I can tell you something about my father though. He was a clown too, and while performing in Spain, he was given a telegram informing him of his father's death before a show. There was no other clown to replace him and he had to do the show," Mr Cardinali said. Peter Sandow, a 58 year-old Briton, was born in a circus and there is evidence that his ancestors were jugglers way back in 1068. "You can really say it's in my blood," he said. "My mother was a flying trapeze performer and my father was a clown. My great grandfather was a clown too. So it's natural for me to be acting in a circus too." "It's really a full-time job, but we enjoy every bit of it. My wife is in the circus too," he adds. 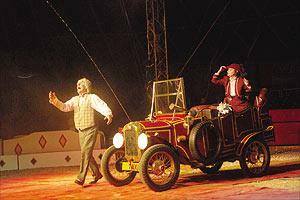 His acts, with a vintage Austin 7 car, is bound to bring many smiles. Thomas Rola, who worked with his wife on the wheel of death in the circus until she gave birth to their seven-month-old son Peter, has had three generations in circuses. "Colette, my wife, worked with me at dazzling heights even when six-months pregnant. But then she started finding it difficult to hold her balance, and has not resumed taking active part yet," he said. How does it feel to walk on a beam, which is turning round some 11 metres above ground? The circus will run until January 7. There will be shows at 4.30 and 7.30 p.m. all days of the week and additional shows at 2 p.m. on Saturdays and Sundays until December 19. Between December 20 and January 7, there will be three shows a day. Family packs for two adults and two children cost Lm12. Individual tickets can be bought for Lm5 for adults and Lm3 for children and elderly people. More information can be obtained from the Splash and Fun Park on 2137 4283 or via e-mail at info@splashandfun.com.mt.